With summertime slipping away, we’re all starting to accept that layering and scarf season is right around the corner. I for one love autumn as the leaves change to bright hues of orange and red and the weather is just cold enough to wrap a blanket scarf and enjoy endless cups of tea! As the days are much shorter and the sun sets before 8 pm, there’s no doubt that quick and easy dishes are on top of your list when you’re hungry. 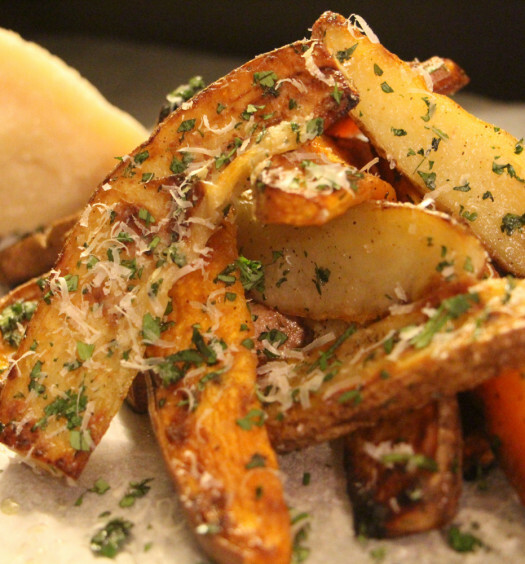 It’s important to have versatile recipes on hand that can be enjoyed for any occasion. I know it’s not even October yet and Halloween hasn’t come but…Christmas trees are for sale so we’re only three months away from Christmas which means work parties and dinner parties galore. Time to start thinking of quick and easy appetizers and snacks for the festive season fast approaching. 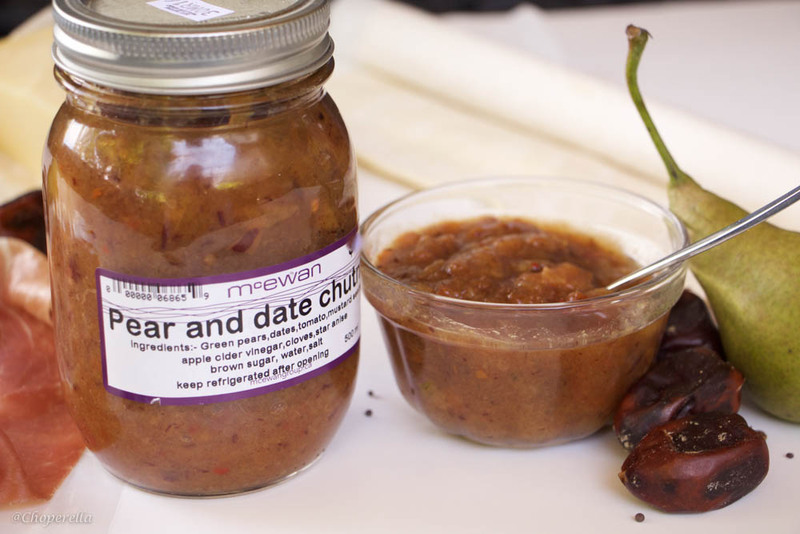 McEwan Foods offered me their McEwan’s Own Pear and Date Chutney to create a quick and easy recipe. The chutney is pleasantly sweetened with the dates and pear and has undertones of spice from the star anise and cloves. It quickly reminded me of a cheese board when I tasted it; one of my favourite appetizers for parties or substitute for a lazy dinner! When I create a cheese board it usually has fruits such as dates and pears, cheese, prosciutto, salami and crackers or baguette. So I thought why not put it all together in one bite! I visited the McEwan Foods Don Mills location, which is their flagship location. My first experience there and it was great! The staff is very friendly and warm, always looking to help you in anyway possible. The store is organized well and everything is very easy to locate in the aisles. I was impressed with how much selection they had and their array of multicultural products. My favourite part about McEwan Foods was their hot table, cheese and deli section. Their hot table showcases their popular meals to go and they have such a vast selection to choose from. The cheese and deli counter isn’t overly large but has quality cured meats, pâté, deli meat, cheeses and more. I’m a sucker for good cured meat so I picked up organic prosciutto for the recipe along with black truffle pâté and chorizo to enjoy. This recipe is quick and easy. 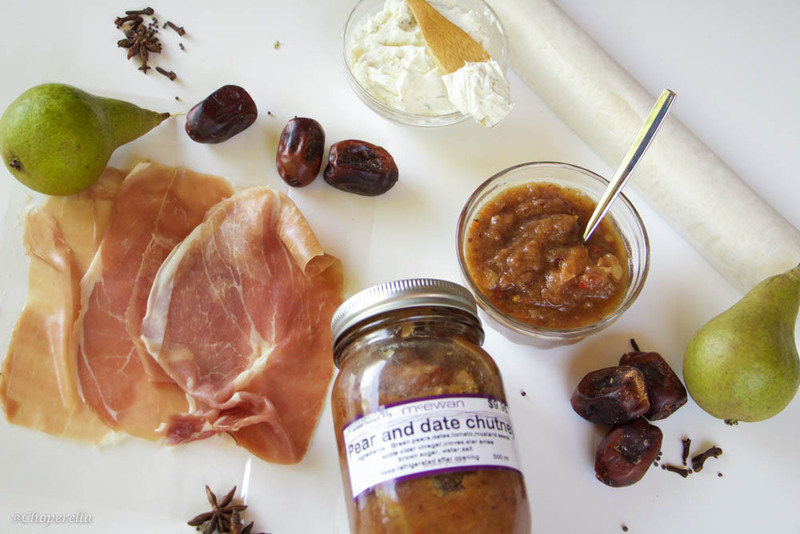 You can find the ingredients in your local grocery store except you will need to make a special trip to McEwan Foods to pick up their Pear and Date Chutney. Luckily, there’s a location in the heart of downtown! It’s in the underground Path in Toronto, located right near Union Go Station, a convenient location to pick something up on your way home. Using only four ingredients, this recipe is quick and easy! 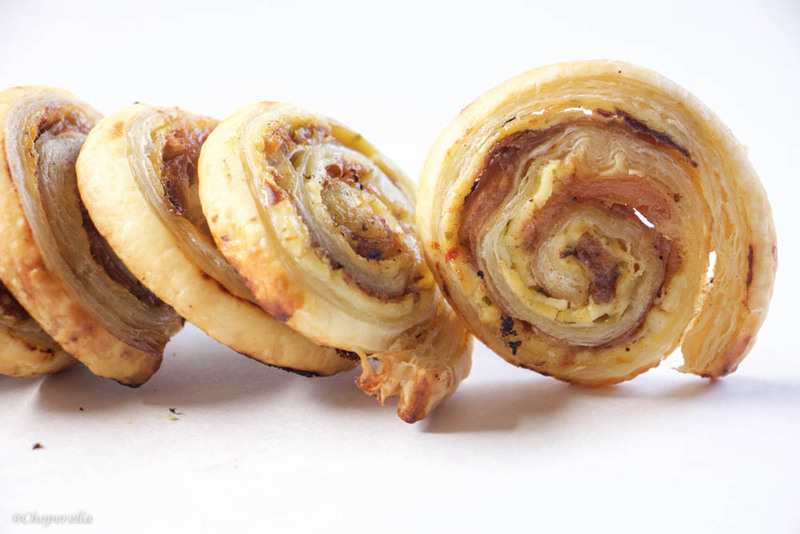 You can enjoy this as an appetizer, a snack or even for a party. It looks fancy; tastes fancy yet takes very little time and effort. This post has been generously sponsored by McEwan Foods located at Don Mills Shopping Centre 34 Karl Fraser Road Toronto, ON M3C 0H7 T: 416-444-6262. 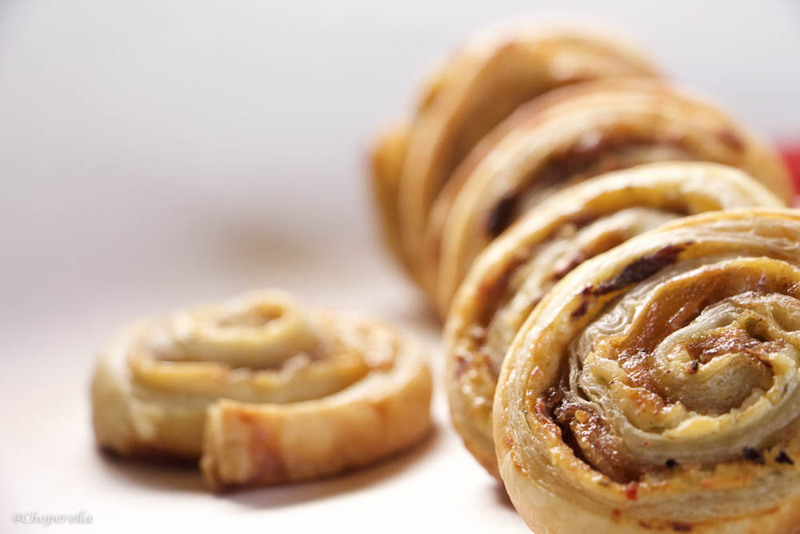 On a lightly floured surface, unroll the defrosted puff pastry. Spread the Cream cheese over the puff pastry leaving about a 1” border on one side of the pastry lengthwise. 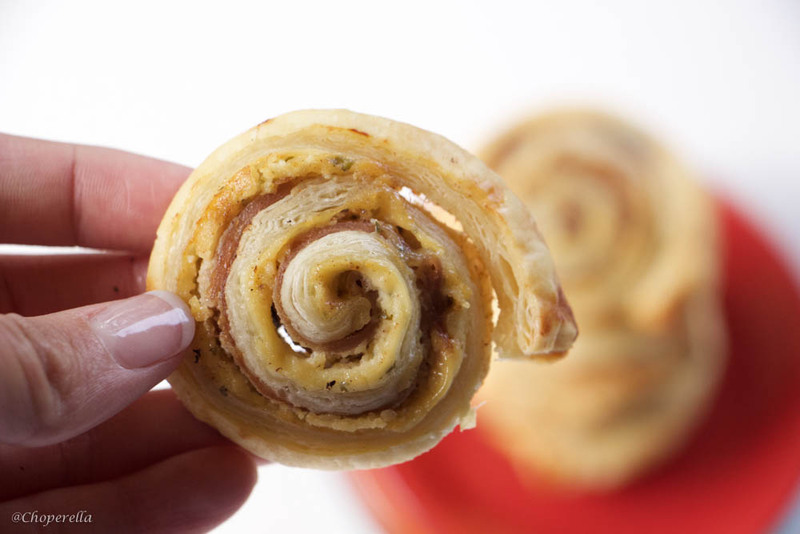 Roll the puff pastry up towards the side with the 1-inch border. Keep the roll as tight as possible. Wrap in plastic wrap to help keep the shape. Put it in the freezer for 45mins – 1 hour to set. This will allow you to slice it easily in rounds so it doesn’t smoosh down. Pre-heat the oven to 400°F and line a baking sheet with silpat or parchment paper. After about 1 hour in the freezer, take it out and let it sit for about 15 minutes. Using a sharp knife, slice into 1-inch thick rounds and spread out with 1-2 inches in between (they will spread a bit!). Bake for 20 minutes until nice and golden brown. Take them out and cool for 5 minutes before serving. What a great idea with adding chutney! 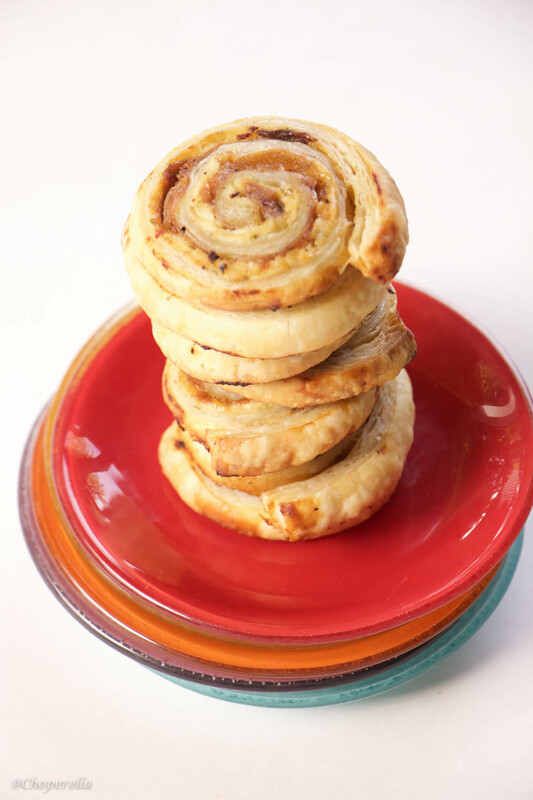 I usually make these pinwheels and use mustard, but it makes so much sense to add chutney since I love eating them with something sweet anyway. Love it! Thank you Julia! I’m the same, I pair almost everything with a sweet chutney when I can. I hope you like it! Thank you Shareba! It’s delicious, and they have a couple others you could try it with as well! SWEET foodies! These looks amazing! Cannot wait to try them! THank you Alisha! They’re a great appetizer/ finger food! I hope you like them! These sound so good……and your pictures alone are always mouth watering. Love chutney!! That’s so kind of you, thank you, Gloria! It’s never easy to get a good shot so I was very pleased with how these photo’s came out. I hope you do try them!